Place the sliced apples in the crock. Add sugar, cinnamon, nutmeg, salt and flour; stir to combine. To make the topping, mix all of the ingredients together until it resembles coarse crumbs. 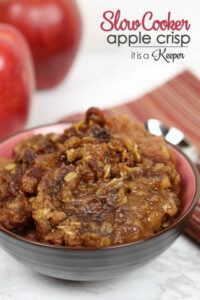 Spread topping on top of apples in an even layer. Set slow cooker to low and cook for four hours.